I’ve been trying to update my work wardrobe. I work in a casual environment but because of my level I try to dress a little nicer than just jeans…sometimes. What I’ve realized though is that I need comfy. Jeans are not always comfy so if I can find some slacks that look good and feel good to wear then I’ll be golden. 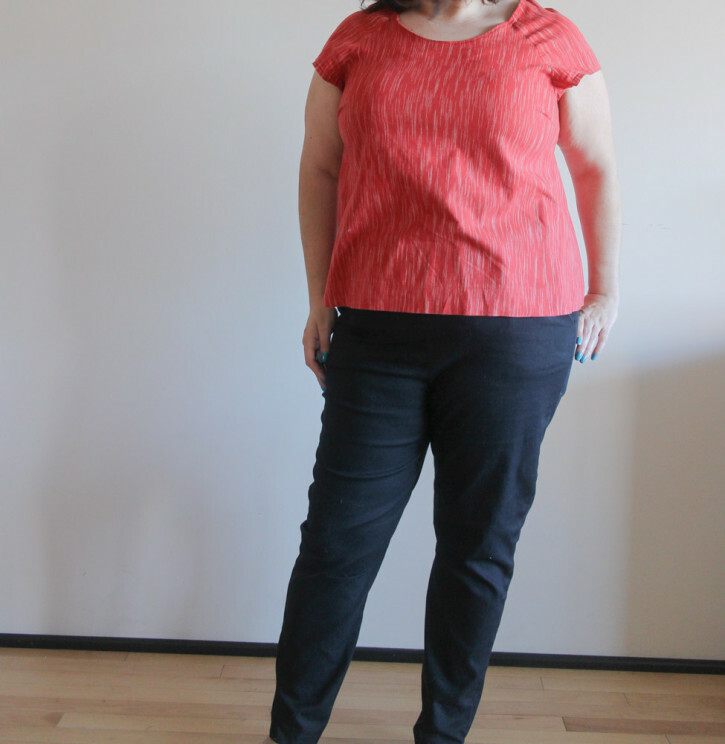 Last year Style Arc and Threads did a “limited time” promo for a free Style Arc Pants pattern – the Barb. They describe it as: Barb’s Stretch Pant is a new version of our famous Linda pant. Features a slimmer leg but not too slim, perfect for the office. Which actually sounded perfect! I cut a size 20 which was closest to my waist measurement. Because these pants are made of a stretch fabric and have an elastic waist they are very forgiving. However, Style Arc does use 3/8″ seam allowances so you don’t have quite as much room for seam allowance adjustments if needed. I did a few flat pattern adjustments on these. The first was to add 3″ to the rise. With the wider elastic I wanted them to be up on my natural waist. I used 1.5″ elastic instead of 2″ elastic so I essentially only changed the rise 2.5″. I changed the crotch curve to match the pants I made in my Palmer/Pletsch pants fitting class. The biggest adjustment was adding pockets. Especially for work, pants must have pockets! I need a place to keep my phone and clip my ID badge. I liked the pockets on the previous mentioned Palmer/Pletsch Class pants so I used those pattern pieces for these pants. 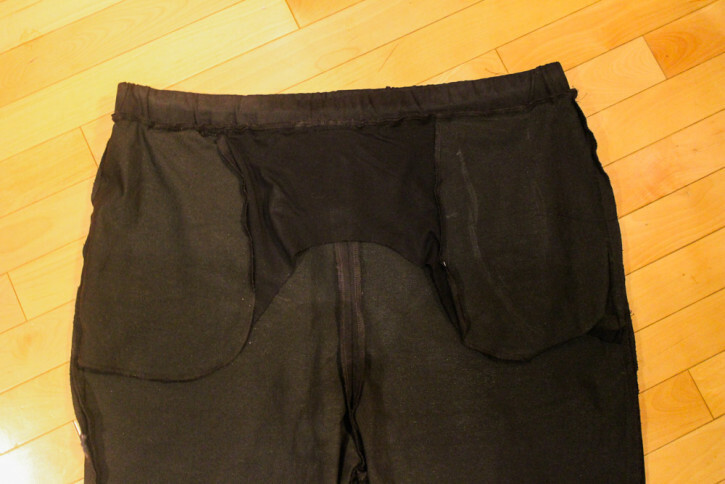 I had to redraw the pants from to create the slash pocket. Then I reused the pocket bag, but I had drafted a pocket stay mean for a zip fly. Since these pants are pull ons, I had to redraw the pocket stay to be cut on the fold and match up with the pants front pieces. Drafting pocket stays is one of the best things I learned in my pants fitting class. If you’ve ever tried NYDJ jeans or pants, they do this to provide their “slimming technology”. Basically it’s built in Spanx! For these pants I had to figure out what kind of fabric to use. The main fabric is a stretch woven, but it would be too bulk to use for the stay. I needed something that would stretch and be thin. I ended up digging through my scraps and finding a piece of black cotton jersey that worked perfectly. It’s a bonus that I don’t have to finish the edges! That makes it be even less visible. Sorry for the crap photo! I had to play the contrast levels so you could see the black on black. 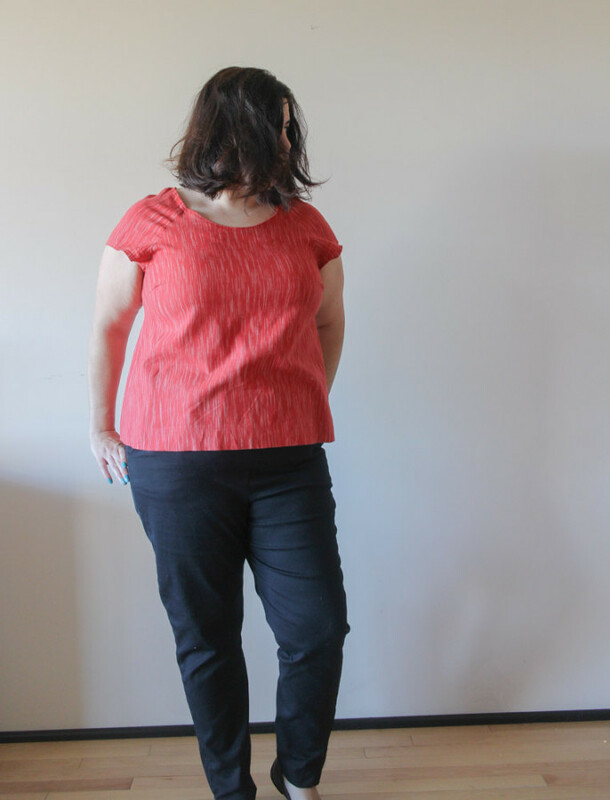 The fabric is a Sew Classic Bengaline suiting from Joann. It’s normally $10/yd but I’m sure I used a 40 or 50% off coupon. The content is 81% polyester, 15% rayon and 4% spandex. It’s not the fancy bengaline Style Arc recommends (and sells), but I am very happy with it for the price I paid. It’s a perfect weight for these pants. I used 1.5″ Knit Elastic for my waistband and finished all my seams on the serger. These are so versatile! I can go casual with a t-shirt or tank and my chucks. For work I wear them with a blouse or sweater and my ballet flats. I have yet to wear these out but they would look great with a slinky top and some wedges. I totally love these pants! 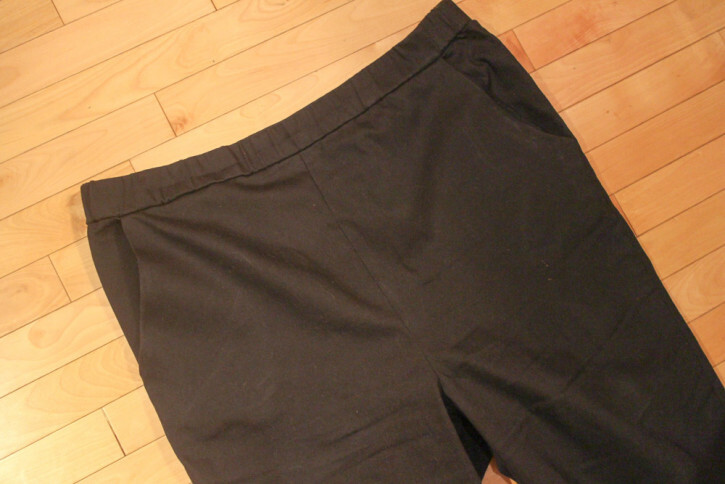 The high waist and pocket stay are very slimming and the leg width really is perfect. I like my pants to be slim fitting without being skin tight. These whip up so quickly that I need to make some more!